The all new BMW 5 Series 520d Luxury Line is the mid range trim in its model series and it has been equipped with an incredibly powerful 2.0-litre diesel mill that is designed with 4-cylinders and 16-valves. This particular trim has been blessed with BMW Luxury Line features. These are mostly styling based features which are on the interiors as well as the exteriors. Inside this variant, you will notice fine-wood trim anthracite finish on the dashboard, the seats are covered with premium Dakota leather upholstery with exclusive stitching, car key with pearl gloss chrome finish and so on. This particular trim also gets the chrome plated BMW kidney bean shaped grille along with a few exclusive design features garnished in chrome. The German automaker is offering an advanced BMW ConnectDrive system that comes with Professional Navigation System integrated to a 25.9cm color display. It also gets the iDrive system with touch controller, DVD Drive and integrated hard drive for audio files and maps. Coming to the safety aspects, this Luxury Line trim has been blessed with some of the sophisticated protective functions including active front headrests along with active protection including attentiveness assistant, airbags and various other first class functions. The facelifted version of the new BMW 5 Series trim gets minor modifications in terms of its exteriors, especially on its front and rear profiles. To start with the striking front profile, this BMW 5 Series 520d Luxury trim has been fitted with a revamped headlight cluster that has been incorporated with powerful adaptive LED headlights. The center of the frontage gets the BMW Kidney Bean shaped radiator grille that is garnished in chrome, while the prominent company logo is fitted above it. The bumper too gets a re-treatment and most of its area is occupied by the air dam and air ducts. The side profile of this model remains very sleek yet expressive with character lines on the doors. The door handles and the ORVMs have been painted in body color, while the window sill has been garnished in chrome. The wheel arches have been fitted with light multi-spoke style alloy wheels that complete the side view. On the rear, the design of the taillight cluster received few tweaks along with the bumper that also has some modifications. The overall look of this facelifted version is incredibly stylish better than any other model in its segment. The interior design of this particular trim looks absolutely stunning and it will surely offer a luxurious feel to all the passengers. The inside cabin of this trim gets the Luxury line features including fine-wood trim anthracite finish on the dashboard, premium Dakota leather upholstery with exclusive stitching, car key with chrome trim and several other styling aspects. The entry sills have been illuminated, which will further add to the elegance of its interior. The company has incorporated this trim with some of the equipments including electrical glass roof, lumbar support for driver and front passenger, stop/start function button, sport leather steering wheel with gearshift paddles and various other advanced equipments. One should talk about the cabin space of this BMW 5 series model, which is ample and it is good enough to offer seating for at least 5 passengers. Apart from this, this particular trim has been bestowed with advanced BMW ConnectDrive functions that indeed enhances the luxury levels for the occupants inside. Powering this facelifted version of the BMW 5 Series 520d Luxury line mid level trim is the advanced and powerful 2.0-litre, 4-cylinder, 16-valve diesel power plant that has the ability to produce a displacement capacity of 1995cc. This engine can produce a maximum 184bhp of power at 4000rpm, while delivering a pounding torque of about 380Nm in between 1750 to 2750rpm . The rear wheels of this vehicle derives the engine power through an advanced eight speed automatic transmission gearbox and returns a peak mileage of about 18.48 Kmpl. This engine powers the vehicle to reach a speed of 100 Kmph in just about 7.9 seconds, which is incredible. 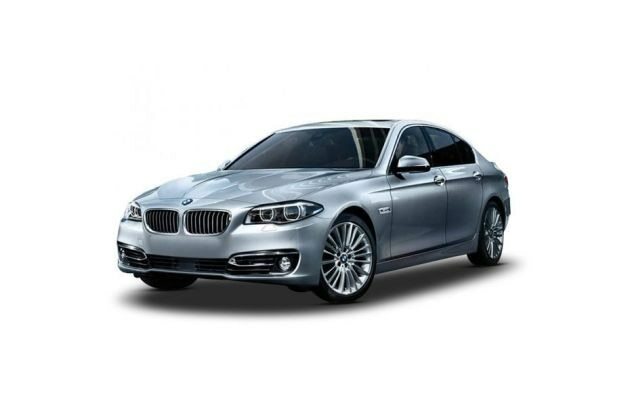 This BMW 5 Series comes with an advanced braking mechanism that functions in a very effective manner without any compromise. The company has fitted all the wheels of this executive sedan with disc brakes and enhanced its mechanism with sophisticated Anti-lock braking system, which indeed reduces the risk of skidding and improves the stability of the vehicle in sudden braking condition. Furthermore, the company has incorporated cornering brake control system that will distribute the brake force during the brake whilst cornering. Apart from this, the company also blessed this variant with advanced traction control programs such as Dynamic Stability control including Dynamic Traction control program. The facelifted version of the BMW 5 Series model is a highly acclaimed luxury sedan model available in the segment and it has just got better as the company has improved its interiors. Also the company has blessed this luxury model with exciting luxury features including multifunction for steering wheel, automatic air conditioner with 2-zone climate control, floor mats in velour, lumbar support for driver and passenger seat, roller sun blinds for rear window, power windows, power steering system, electrical seat adjustment with memory function, ambient light, start/stop button, sport leather steering wheel with gearshift paddles and several other exciting features. The German automaker has shown an uncompromising approach towards the safety and security aspects of this vehicle. This premium sedan includes a list of safety functions include active front headrests, active protection including attentiveness assist, ABS with cornering braking system, Runflat tyres with indicators, side impact protection, warning triangle with first-aid kit, airbags for driver and front passenger, head airbags for front and rear, side air bags for driver and passenger, electronic vehicle immobilizer and crash sensor and various other functions. These advanced functions will ensure all the passengers will be in a safe condition even when severe damage occurs while on the go. Pros : Captivating exteriors, performance packed engine. Cons : Fuel economy can be made better, pricing can be made competitive.